One of the things that attracted me to Miguel Ases jewelry is that he incorporates gemstones and crystals into his seed bead creations. In the world of jewelry, gemstones and crystals are my first love. And now that I've spent my time learning the basics of how to weave seed beads around (and with) crystals, I thought it was about time I try to add some gemstones. My first attempt is adding 3mm rose quartz rounds to the picot edge of this brick stitch earring. If you compare this to the first picture, you'll notice it starts off the same: a pink crystal drop in the center, surrounded by 1 round of brick stitch using 11/0 cylinder beads and one 3mm crystal above the drop. 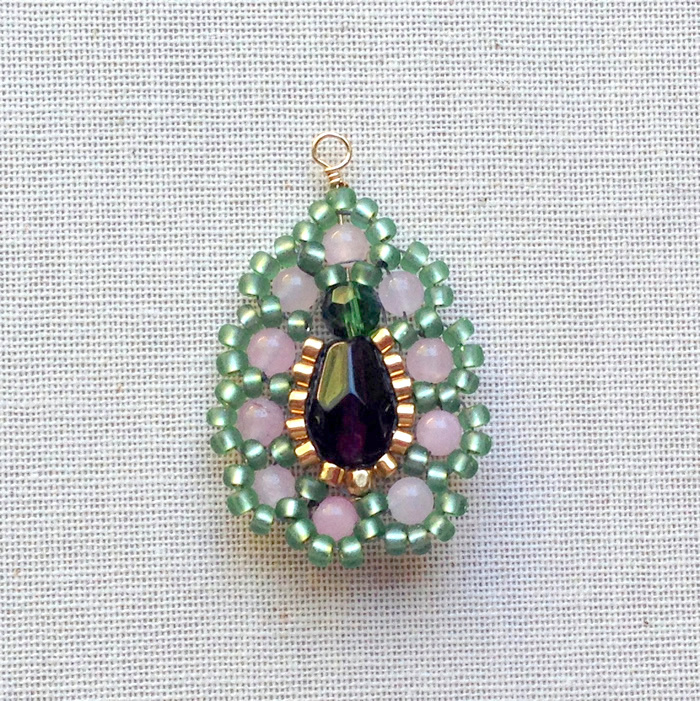 For the second round of brick stitch on this earring, I used 11/0 Miyuki rounds and 3mm smooth rose quartz beads as the decorative bead on the picot. It changes the look considerably. And because I am not the type of person to leave well enough alone, I had to take my experiment one step further and add a border around the rose quartz picot. I don't know what the stitch I added to surround the rose quartz rounds is. My guess is that it is still brick stitch, just with a lot more beads in between. I wish I took a picture of this one with the light going through it. The center drop is deep purple. I was aiming for tourmaline colors. It's very feminine, don't you think? I may be heading in a new direction soon - well, not really a new direction. I'm trying to learn how to do beaded fringe. Just tried my first fringe today. Wrecked it - and not in a good way, lol. I'll post results when I get a better grip on things. How do you put the wire bale on this piece? I thread a headpin through the center beads and then make a wire wrapped loop to hang the component. It is a little tricky, but I find that I can either thread in the headpin while I am still weaving beads and slide it out when I need to use the hole for the thread path or I can put in the head pin at the very end. The problem with doing it at the very end is that the beads don't always align like you want them to (i.e. centered).